Sidney C. Howard standing in front of an American Field Service ambulance in Alsace, France in 1916. Photographer unknown. RG1/019, John C. B. Moore Collection. This image cannot be reproduced without permission from the Archives of the American Field Service and AFS Intercultural Programs. This photograph of famous playwright and screenwriter Sidney Coe Howard (1891-1939) was taken in France during World War I, and was found in John C. B. Moore’s wartime scrapbook. 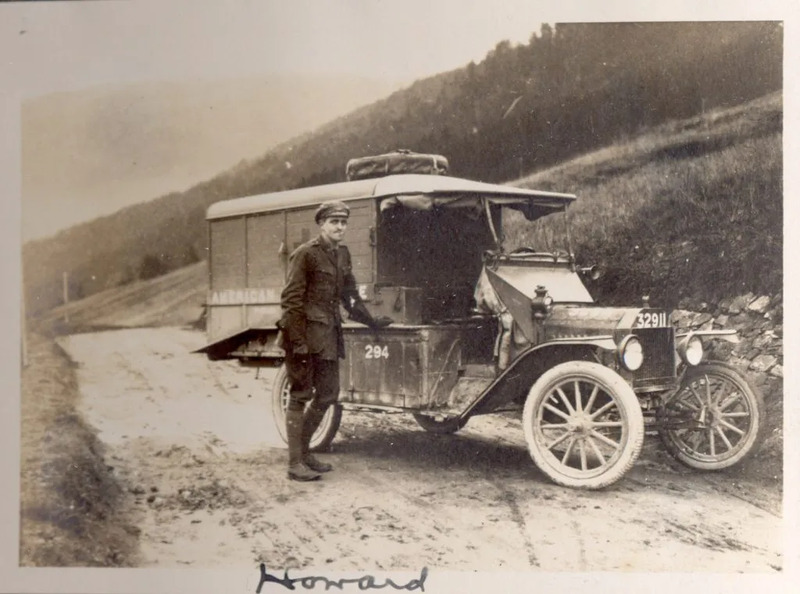 Howard joined the American Field Service as an ambulance driver in June of 1916. He was sent to Alsace, France with SSU 9 until December of 1916, when he joined the newly-formed SSU 10 unit serving with the French Army of the Orient in the Balkans. Howard later joined the French aviation units following the militarization of the American Field Service in the fall of 1917. Howard was the author of many plays throughout his career, including “Labor Spy,” “Yellow Jack,” “The Silver Cord,” and “Paths of Glory,” and won the 1925 Pulitzer Prize in Drama for “They Knew What They Wanted.” In addition to being nominated for the screenplays of “Arrowsmith” and “Dodsworth,” he won a posthumous Oscar in 1939 for writing the adapted screenplay of “Gone With the Wind.” Howard died in a tractor accident on his Pennsylvania farm at the age of forty-eight, four months before the premiere of the film.